Home Movies Dumbo, Do We Have Liftoff? This review will be two reviews in one. First off, will the kids like this movie? Boy, I am hard pressed to say one way or another. The audience I saw it with included a fair share of children and I didn’t hear much laughing, giggling, or gasps of glee. Maybe they were delighted within. However, unlike the 1941 animated version, this Dumbo, nor Mrs. Jumbo his mother, speaks, so that needed connection between a kid and a character is solely dependent on the digital animators’ abilities to make the little elephant come alive through his big blue eyes. It didn’t work for me, but it may for your child. As for the adults in the audience, particularly for all of us Tim Burton fans …. well, let me start at the beginning. The first scene of the film, the tracking shots of the Casey Jones Junior train pulling into the circus grounds, all the animals and acrobats, the old and worn train cars painted with period advertisements, the Maxfield Parrish turquoise skies, were absolutely beautiful. Rick Heinrichs, the production designer that has been with Burton since his youthful days at Disney, from their first film together, Vincent, creates a world that hums with charm and the possibility of magic. Danny Elfman’s music, as always, hits just the right note, a perfect alchemy of artful boldness, wry humor, and earnest pathos. At this point, it’s looking good. Then the actors enter the scene. Danny DeVito plays the nice Danny DeVito, as opposed to the creepy Danny DeVito. Colin Farrell as Holt Ferrier returns from the first World War minus an arm, but hoping to restart his life as a lasso-tossing trick rider. In his sad-eyed, laconic performance, underplayed as much as his touch of Texas accent, he steps out of the steam at the train station to meet his motherless children, his wife having died while he was away fighting in France. Nice set-up, but the trouble begins with his children, particularly his daughter Millie, played by Nico Parker, in her first film role. A striking looking child, her acting is as wooden as the weathered boards on the side of the train cars. Playing a smart and scientific child, the young actress interprets that as speaking in a robotic, unemotional and unengaging monotone, every line a concluding sentence. Her brother is a little more natural, but not enough for the two of them to be the empathic anchors of the film. Without being able to feel for and with the kids, it’s bumpy skies ahead. Along for the ride is a group of low-rent circus performers, all pleasant as can be, and all representing the classic Burtonesque troop of outsiders … an African-American strongman and accountant, a plus size, sweet-singing mermaid, an Indian snake charmer, a married pair of Hispanic magicians … but they’re markedly bland, making me long for the earlier menageries of characters in Beetlejuice, A Nightmare Before Christmas, and Ed Wood. And then there is Dumbo. 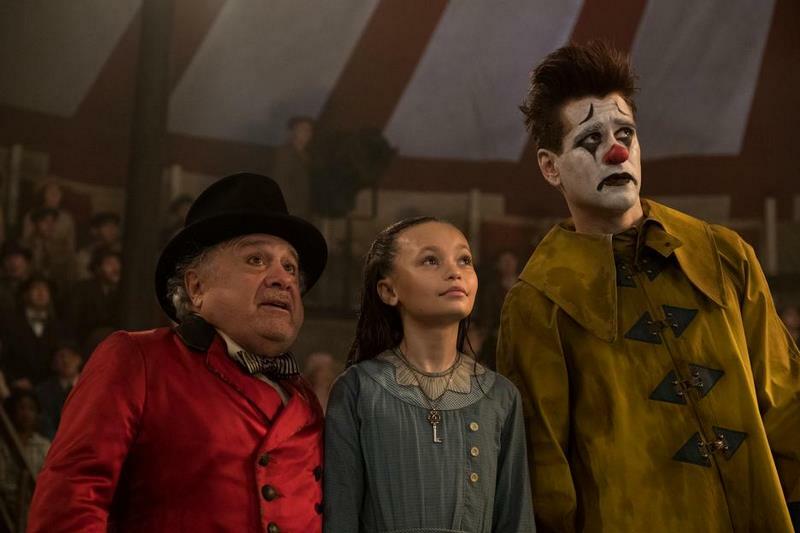 The first time he flew under the big top it was one of the film’s rare moments of magic, largely due to Elfman’s swooping score. Other than that, again, pretty bland. For me, he was never a real character but rather a product of digital wizardry. Intriguing in the trailers, but incapable of carrying the emotional heart of the film as he soared and flopped his oversized ears. As for Michael Keaton’s big business man and promoter, V. A. Vandervere, this was a performance aimed at Johnny Depp freakishness (think Burton”s Willie Wonka) but missing the target by the width of this fair land. It was frankly an awful performance by a fine actor. It’s too bad, too, because Burton used to be so good at handling campy performances. Johnny Depp in Ed Wood Christoph Waltz in Big Eyes, or Alan Arkin in Edward Scissorhands come to mind. Alan Arkin actually plays a small role in this film, and to be honest, it was one of the few believable performances. As for the story, it was written by Ehren Kruger, who also penned several of The Ring and Transformer movies. Here, too, he goes for high concept at the cost of an engaging connection to the characters and a plot that matters. Did I mention the production design? I know I did, but I want to say again how great it is. The latter part of the film is set in an elaborate, Art Deco theme park, Dreamland, that in all its glitz, glory and consumerism is both a tribute to Disneyland and a (purposeful?) critique. 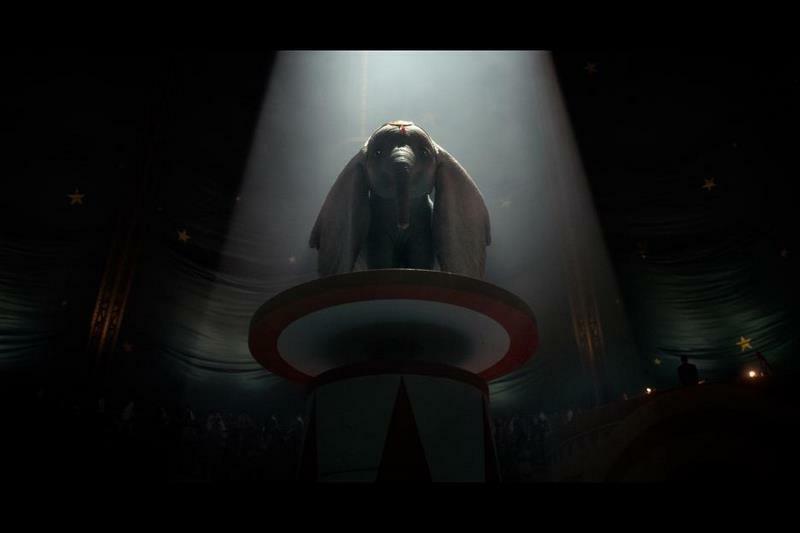 And it’s not the only critique in the film, for, in the end, Dumbo is a message film against animal cruelty and for animal rights, against corporate life and for diversity. It just isn’t very good, and for this Tim Burton fan, a real disappointment. I would love to know if Tim Burton has any more original work in him. Who can forget Winona Ryder dancing in the ice storm of shavings as Johnny Depp craves an angel in Edward Scissorhands? (One of my favorite moments in all film history) Or Jack Skelton delivering creepy Christmas gifts in The Nightmare Before Christmas (shared salute to director Henry Selick)? Or Johnny Depp facing down the Headless Horseman in Sleepy Hollow? Or the dark and bloody world of Sweeny Todd, for my money one of the finest screen musicals of last few decades. God, I miss that Tim Burton. How I miss Burton’s world. Please come back to it, Tim.